Planted weeks ago and took two weeks to germinate, then extremely slow growth. Planted in a 24" plastic window box in potting soil. Have noticed the stems are two different colors. Several plants appear to have buds on the top ends. 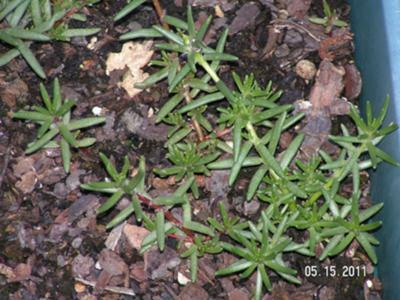 Leaves appear to be 3/4" long approximately and plant height ranges from 1 1/4" to 4" in height. We're curious what we really have and what to do with it. Well, I can tell you with 100% certainty that it most definitely is not a Nasturtium! 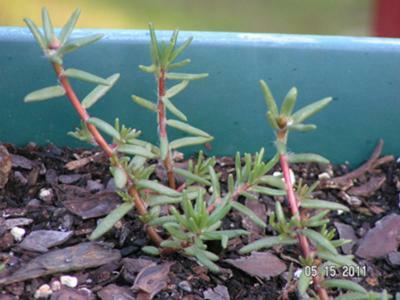 It's possible that you have Portulaca, either the seed you got was mis labeled, or it was in the soil and germinated in a fluke event. 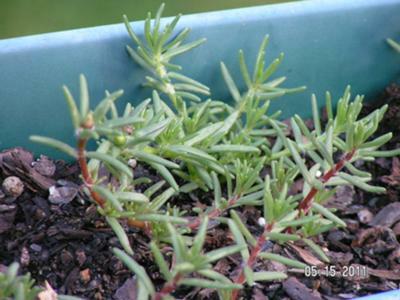 If it is Portulaca, you'll find that out when it blooms, as the flowers will be bright coloured and a satin type texture to them. It will be interesting, that's for sure.